You’ll probably start your search for a home by doing Google searches. 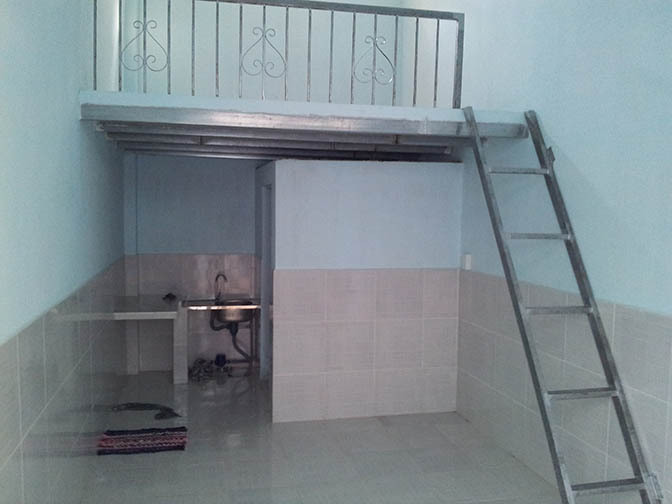 There are some Vietnamese websites that list housing for rent. Avoid the English websites as they are filled with people looking to make a buck off of you. Vatgia – You can buy almost anything from this site. Check their real estate section for rentals. You’ll need a translator like Google Translate to get you through it. Cho Tot – The Craigslist of Vietnam. Used goods and a real estate section with rentals from individuals and companies. Facebook Groups – These groups are filled with foreigners, so some prices might be a bit high for Vietnam, but every once in a while you can find a deal and you can also save by not having to hire a person to take you around. Some signs will be in English and Vietnamese. This was the best strategy we found. A lot of great places don’t advertise online. They just put a sign out on their gate and wait for phone calls. It’s the best way to find gems. You also get a better sense of the neighbourhood when you are on the street, rather than on the computer. The magic words are: Cho Thuê. It means ‘for rent’. 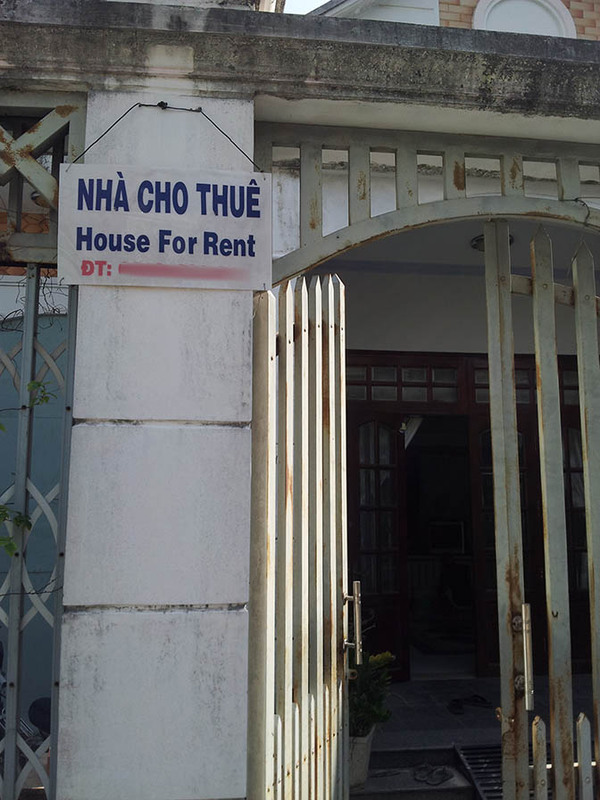 A sign might also say nha cho thuê (house for rent), followed by a phone number. We enabled GPS on our phones and took a photo of all the signs we found. That way we could put them on a map and keep track of them all. Of course, it helps to have a scooter. Walking around in Vietnam is not ideal. The heat and the poor quality, or lack of, sidewalks make renting a scooter well worth it. When you get a few numbers you’ll need to find a Vietnamese person to make calls for you. If you don’t know anyone, ask the hotel clerk. Ours was happy to do it. In fact, she even went with us to see a place after she was done work that evening. What a totally unselfish act! Or was it..? Tell everyone who will listen that you are looking for a place to rent. You’ll be surprised how willing people are to help – mainly because they can make some money off of your dilemma. In Vietnam, the homeowners will often give the first month’s rent to someone who helps find them a tenant. It’ll cost you nothing extra – only the homeowner. Besides the potential gain in profit, people are mostly friendly in Vietnam and if they speak English they often want to show-off or practice their skills. I had random people that I met on the streets calling me about a house that their friend’s sister’s landlord had available. This is the whole house. Kitchen in the back left, bathroom beside it, loft is the bedroom. It’s very rare to take the first house you see. There is a lot of crap out there. You need to be patient, and don’t feel pressured to say ‘yes’. Be sure to check the water pressure. Usually the water tank is on the roof, if not the pressure might be very low. Don’t expect to have hot water coming out of the taps in the kitchen. If the shower is Vietnamese style then it will probably just be a hose and shower head attached to the wall. This isn’t a bad thing, but be sure to check and see if they have a water heater attached to it. 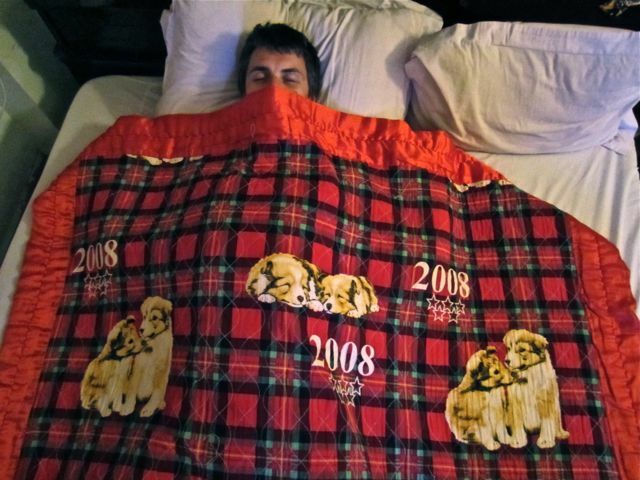 If not, then you’ll either have to buy one or take cold showers. Having an air conditioning unit in the bedroom is crucial, unless you like sleeping in a bath of sweat. It is possible to buy one and get it installed, but they are fairly expensive. A lot of houses won’t have windows in the bedrooms. It may take a bit of looking around to find one that does. Not all places will come with a fridge or washer. Most likely, none will come with a stove or dryer – that’s just not how they roll in ‘nam. Uma – place that sells Ikea type furniture. Gia Re Vietnam – Have a couple locations in HCMC. Expat Blog – Used furniture from fellow expats. Your best bet might just be driving around with your head on a swivel. A store that doesn’t have a website will probably have lower prices than a large corporate store. You can also have furniture made custom for a reasonable price in Vietnam. I Found a Place, Now What? According to Vietnamese law, a foreigner can legally rent a property in their own name if they have been granted permission to stay in the country for a minimum of three months. The duration of the lease has no limitations. So if you have a three month visa, you should be alright. It’s a good idea to have it written in the contract that your landlord will be registering you with the foreign police. This needs to be done, but it is left up to the landlord to do it. If they don’t do it, and it’s not stated in the contract that they would, you could get in trouble. At the bottom there will be a space to provide the date, and both you and your landlord’s signature. You’ll also probably need a photocopy of your passport and the Vietnam visa page that’s in it. Many landlords will want to you to stay for 2 years, but this can be negotiated and I recommend you do your best to get it down to a year. You don’t know what unforeseen problems may arise (for example, roosters living next door). In Vietnam, they often ask for three months rent for a deposit. Again, try and negotiate that down to a month or two. If you can’t, make sure it’s in the contract. Some landlords will even want 6 months deposit. I think that’s way too much and I would probably walk away. I’ll stress this point with some italics: Any money you give to a landlord will be hard to get back. This has been proven time and time again in Vietnam. Landlords will do anything they can to keep your deposit, so get it down to as low as you can, and give them no excuses to give it back. We were pretty friendly with our landlord. We went to his house, met his family, had him over for dinner, and more. In the end, he refused to give us back a month’s rent, saying that we broke the contract. Technically, I guess he had a point. Our last month in the house we were traveling, so we weren’t able to give him that month’s rent. He knew this would be the case and he seemed to have no problem with it. We figured he would just take it out of the 2 month deposit we had given him. Well he did, but he also kept the other month’s rent because we broke the contract. We even let him work on the house while we were traveling that last month. So basically, he had complete access to the house a month earlier than he should have, and he got the rent for that month plus an extra month’s rent. In Vietnam, there is very little legal action you can take – especially if you don’t speak the language and you have to leave the country in a few day (like we did). My point is: be very careful. Finding a loophole (or creating one) in a contract isn’t dirty in Vietnam, it’s cunning. When the contract is signed the landlord will have 30 days to register you with the foreign police. He may need to borrow your passport for that, and might need proof of employment. It’s unlikely that you will have electricity included, but sometimes the landlord will work a deal out with you to pay it and then bring you a photocopy of the bill. Rent is usually paid at the beginning of every month. Probably in the form of cash. Bills that you have to pay (most likely all of them) are brought to your house. If you are home you simply give them the cash and they go away for a month. This even includes internet and TV. If you aren’t home, they leave a bill and you have to go in to pay it. Make sure to keep track of your bills and what you have and have-not paid. Finding a place to live can be overwhelming and stressful at times, but try and look at it as an adventure. Guesthouses are inexpensive, so take your time and don’t rush into anything. You may see some terrible places and feel like you’ll never find anything to your liking, but keep searching. That gem could be right around the corner.